My blog was abandoned for too long. Now my oldest son has finished the 3d grade and is gone to a 10 day camp organized by our church. It will be his second year and he enjoyed it greatly last summer. I am starting to relax after a busy school year and enjoy some craft time. Here's the Botanical collage I made inspired by Jacqueline. 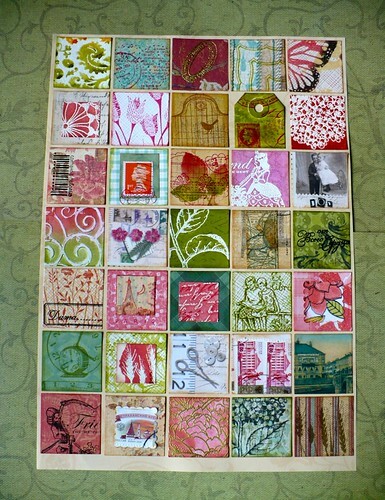 I fully enjoyed the creative process, going through left over stamping projects and papers. It is very satisfying. I used my green and pink colors, as this color combo my mother-in-law loves. This is a gift I will bring her when we'll be visiting in July. And I made the Ex Libris collage for my room. Most of the stamps used are by Hero Arts. I used stamping, embossed images in white and gold, whiter spraying, old postal stamps and a bit of paper-piecing. I had lots of left-over squares that did not fit the into the collages. So I turned them into cards. These quick thank you cards I made for the teachers in the end of the school year. I liked the one with tulips and I tried the same overlay but using hearts. Quick and effective. Our boys (Yegor - almost 10 y.o., Timothy - 5,5 y.o. and Fiodor - 3 y.o.) are growing. This is a recent picture from our family walk in the park and Fiodor's birthday party. Thank you for visiting! Have a good day! Dear Maria, this is a beautiful blog-post. Your sons look radiant and happy - praise the Lord! I can see you enjoyed yourself using up your paper scraps to make such a beautiful grid decor for your MIL. And those cards are gorgeous too!